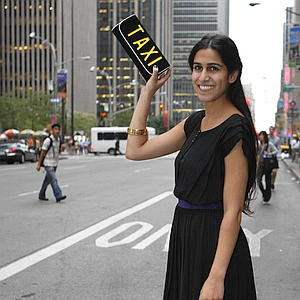 Jet Set Smart: FASHION FRIDAY: A FASHIONABLE WAY TO HAIL A CAB! (1) stick out your arm, or (2) whistle! Well, a designer from Manhattan, Regine Basha (her father is Aaron Basha- famous jewelry designer), has come up with a new and more fashionable way to hail a cab...a handbag or "taxi clutch" with the word TAXI spelled out across the front. Ok, so you are wondering, how can a cab driver see that?...well, the word TAXI is designed in lights that can be switched on and off when you need to hail transportation. The taxi clutch costs $225...check it out on her website which just launched last night 2Enlight10!